The BlessU-2 robot priest is a German celebration of the 500th anniversary of the Reformation. A robot priest that delivers blessings in five languages and beams light from its hands has been unveiled as part of an exhibition to mark the anniversary of the start of the Reformation, a Europe-wide religious, political and cultural upheaval sparked when Luther nailed his 95 theses to a church door in the town. Half a millennium later, the robot, called BlessU-2, is intended to trigger debate about the future of the church and the potential of artificial intelligence. The robot raises its arms, flashes lights, recites a biblical verse and says: “God bless and protect you.” If requested, it will provide a printout of its words. Science fiction writers have enthusiastically explored the robotic clergy. 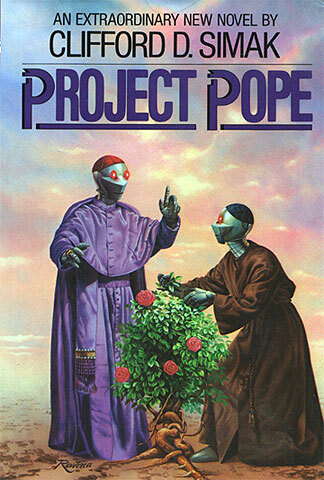 In his 1971 story Good News From The Vatican, writer Robert Silverberg tells the story of a robot cardinal who might one day become pope. Clifford Simak wrote on a similar theme in his 1981 novel Project Pope. Getting to his feet he crossed the waiting room to the Padre booth; inside he put a dime into the slot and dialed at random. The marker came to rest at Zen. "Tell me your torments," the Padre said, in an elderly voice marked with compassion. And slowly; it spoke as if there were no rush, no pressures. All was timeless. Joe said "I haven't worked for seven months and now I've got a job that takes me out of the Sol system entirely, and I'm afraid. What if I can't do it? What if I've lost my skill? The Padre's weightless voice floated back reassuringly to him. "You have worked and not worked. Not working is the hardest work of all." 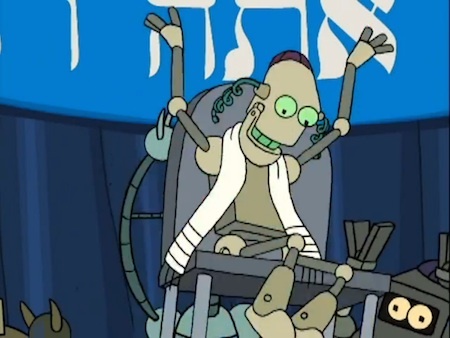 Fans of Futurama may recall this depiction of a "bot mitzvah". Don't miss 'Electronic Mufti' May Issue Machine Fatwas and Information Age 'Pray-O-Mat' if you're as absorbed in this topic as I am.